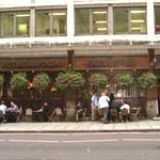 The Penderels Oak is a classic pub offering a choice of beers, wines and spirits together with classic pub fare all day. Entertainment includes fruit machines and quiz machines. In fine weather there is additional seating on the pavement area. Do you work at Penderels Oak? What did you think of Penderels Oak? As a Wetherspoons pub, Penderel's Oak is good for a quick meal and a few cheap lagers, but it's not really somewhere I'd go for a huge night. In saying that, we got great service and the food was fairly tasty (and good sized portions as well). At least with Penderel's Oak you know what you're in for. If you are near Holborn I recommend that you make a visit. A very good place to chill out if you are shopping in west end, especially at weekends. With attentive staff and excellent well kept real ales you can't go wrong here, visited today (21/7/13) cider festival on I'm in heaven ! Only criticism I have is when you have to recycle the toilets are down stairs (good exercise or so I'm told) Still highly recommend well worth a visit. Penderels Oak is the sort of place people might congregate if London were suddenly plunged back into the Blitz, such is its mammoth size. It may be big but it holds itself well both inside and out. 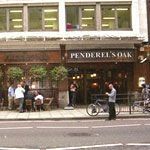 Located on High Holborn, Penderels Oak takes up the equivalent of four shop fronts and once inside you’ll see it plunge back some thirty metres and down one level, too. The decor is simple with a mock Tudor approach and although this may seem a little lame, it does split up the wall space that could easily have looked deserted. There are all the types of seating that you could hope for with comfy sofas, booths and simple tables and chairs to choose from depending on your mood. Features are aplenty, and the bookshelves are a crafty way of inspiring a lounge feel in certain areas, even if they are filled with journals and other naff-looking spines. The cellar bar deserves a mention in its own right if only for its strange relevance to the set of Cheers. Its booths and lighting conjure up memories of Sam and Rebecca and ‘will theys’ and ‘won’t theys’, it’s a trip back to Boston. The usual Wetherspoon rules apply (of course this is a Wetherspoon pub) at Penderels Oak, the people are a rich mix of the social spectrum from well to dos all the way over to ne’er do wells. On one table you’ll hear a woman proclaiming her desire to win Mastermind with her specialist knowledge of Kim Deal and on another you might just catch the ranting of a man addicted to the racing of horses. The staff are many and therefore the wait is almost non-existent. With space on your side here, it isn’t hard to find somewhere that you can feel comfortable. The same old Wetherspoon menu exists at Penderels Oak, which incorporates a mix of traditional pub food with lighter bites like salads and paninis. The deals are always good and you can usually buy one and get one free. Look out for Curry Club, Steak Club and Sunday Club. The whole drinks menu probably undercuts the pub’s nearest rival by about fifty pence on every drink so whatever you order will be a bargain. The wine is on tap but if, for some strange reason, you prefer it from a bottle then there are plenty to choose from. There is a good range of spirits and shot specific tipples to start the party and a small selection of ales. The beers on draught include Coors Light, Kronenbourg, Fosters, Stella and Carling. It’s unlikely that everybody will know your name after your visit to the Penderels Oak Cheers Appreciation pub, but it’s friendly enough to come back and remind them all.